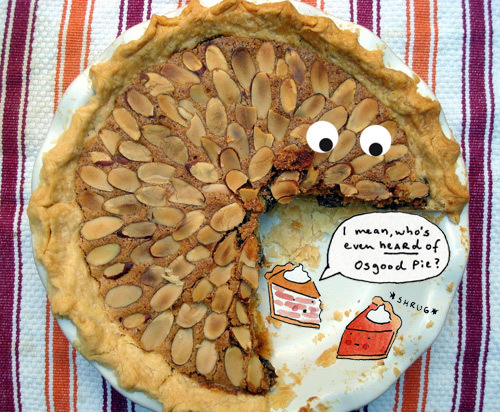 Have you ever heard of Osgood Pie? Didn't think so. Actually neither had I, until I discovered it via Not Martha! While the pie, which is in the tradition of old-time vinegar and chess pies, doesn't necessarily sound like the most appetizing dessert--it's comprised of eggs, sugar, vinegar, and raisins--I was nonetheless intrigued, and I tried to modernize it a bit for my latest contribution to Serious Eats by swapping raisins for cherries and adding some almonds for an added texture and flavor contrast. If I do say so myself, it turned out pretty tasty--once you've wrapped your mind around the vinegar pie idea, that is. You can check out the entire post and recipe, as well as more Osgood Pie lore, over at Serious Eats!